Emails have become an inseparable part of online communication and marketing. In this guide, we’ll show you how to make a professional email address that promotes your business and boosts trust. In addition, you’ll find the configuration instructions for email clients to help you manage all the new mailboxes efficiently. With the rising popularity of mobile devices, checking an email box takes less time and effort than ever before (fun fact: over half of all emails worldwide are opened through smartphones). As of today, over 90% of adults in the United States admit to using email every day. Thus if you need to reach a large audience, email marketing is a great way to get the job done. Add trust to your brand – a custom domain in the address field adds more credibility. Give more control – management gets easier, create and delete mailboxes as you please! Promote your business – people may be tempted to check the website you’re running. The journey of making a custom email address starts by registering a domain name. You can do that right here on Hostinger using our domain checker tool for as low as $0.99! Enter the domain name that you wish to register, and you’ll see a list of viable options. For a more in-depth approach, considering checking our complete domain buying guide. Pssst! We throw in a free domain registration with yearly Premium and Business hosting plans. Get a web address, hosting, and email services with a single buy! 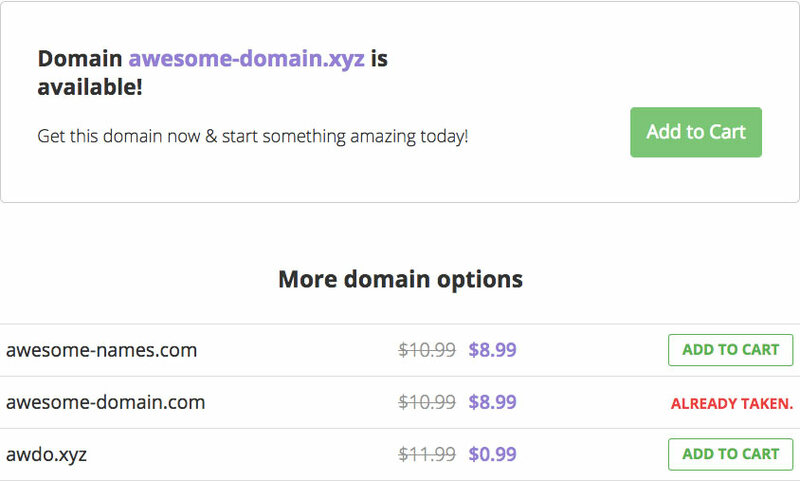 If you have an existing domain, you can use it too! All you need to do is add it to your hosting account and point the DNS to our servers. Alternatively, it’s possible to transfer the domain name to Hostinger (though it is not mandatory). 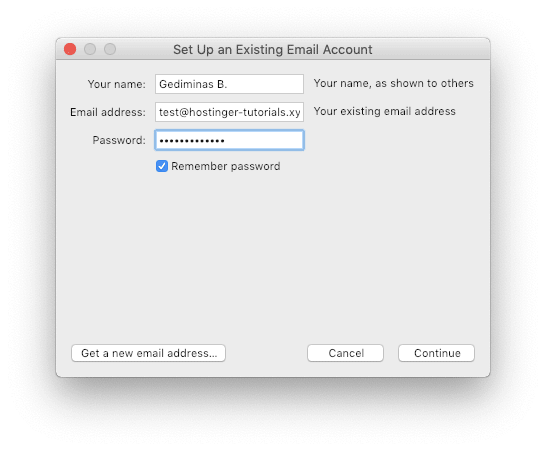 Default Hostinger email. All web hosting plans include personal email features out of the box. No additional payment needed! Premium email services. Alternatively, you can opt for a premium email hosting solution that offers extra features, higher sending volumes, and various tools to improve workflow. Existing Hostinger users can find the premium mail tools in the Power Store section of the member area. If you need email hosting only, the premium choices are exactly what you should go for. However, in case you also plan to host a site, a standard web hosting package will give all you need. That about wraps out our email products. Let’s see how to set them up! Depending on which mail service you went with, the steps to set it up and create an email account may slightly differ. Since all our web hosting plans include email by default, you only need to make sure that your domain is pointed correctly. Once that’s taken care of, you can create an email box and use various other related services in the control panel. To create an email account, simply access the Email Accounts section and you’ll find all the necessary tools to do it. Once this step is completed, you’re ready to use the service! Alternatively, we offer three different mail solutions that are worth considering. If you’re not planning to use hosting, these tools are the perfect pick, as they allow you to have functional email services without owning a web hosting account. An affordable, yet fairly powerful mail sending solution with all the tools to reach your email marketing goals. As soon as you purchase this product, you’ll find a setup wizard in the control panel. Once you start it, you will need to enter your domain name and make a few DNS changes. If your domain is pointed to Hostinger, everything will be done automatically. Lastly, you’ll be redirected to a management page, where you’ll be able to create an email box and access your webmail. The following solution includes a few extra tools and larger sending limits that are suitable for bigger businesses. However, the process of setting it up is nearly identical. After adding your domain, you’ll need to make a few changes in the DNS zone. Keep in mind that we will change your DNS automatically if your domain points to our nameservers. You can then create an email account and start sending. GSuite is a powerful mail solution developed by Google, which is also available on our platform. Once you order it, the setup wizard will appear in your control panel. 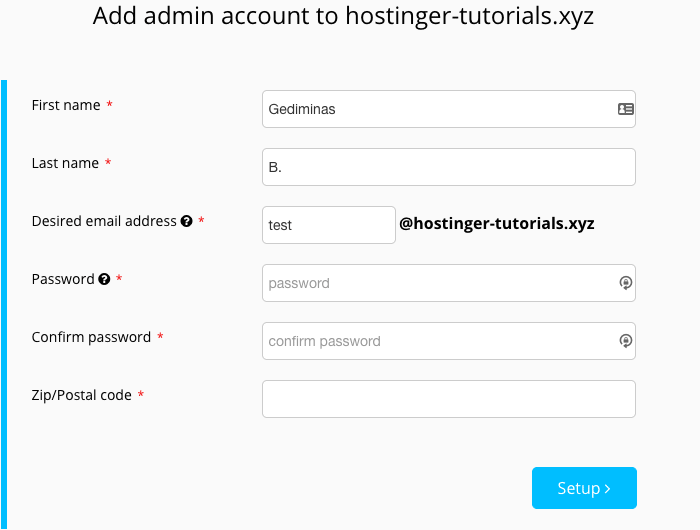 If your domain is pointed to Hostinger, all required MX records will be added automatically. Otherwise, you will need to perform the Google MX record change manually. As soon as you complete it, you will have access to a management panel which allows you to create an admin email account and perform management tasks. Click the green Create button to start the administrative mailbox setup. Once you fill in the details, go ahead and access the newly created admin account. To finalize the setup and begin using the services, you will also need to verify your domain with Google. Before you start blasting the mail cannon, you should personalize your email address to give it a professional feel. If you’re running a business, then you’ll need a couple of general purpose mailboxes (such as contact@example.com or support@example.com). In case your goal is to do outreach, you’ll need something different. Since personalization is a big part of successful campaigns, you can go for something like firstname@example.com or firstname.lastname@example.com). According to an email open rate study, around 60% of recipients take the from address into account when deciding whether to click or skip a letter. Another low-hanging fruit that you can use to gain the upper edge is a signature. You can put crucial company information such as contact details, logo, email in there, which will increase your brand visibility. Once generated, head over to your email settings and you’ll be able to paste it in. 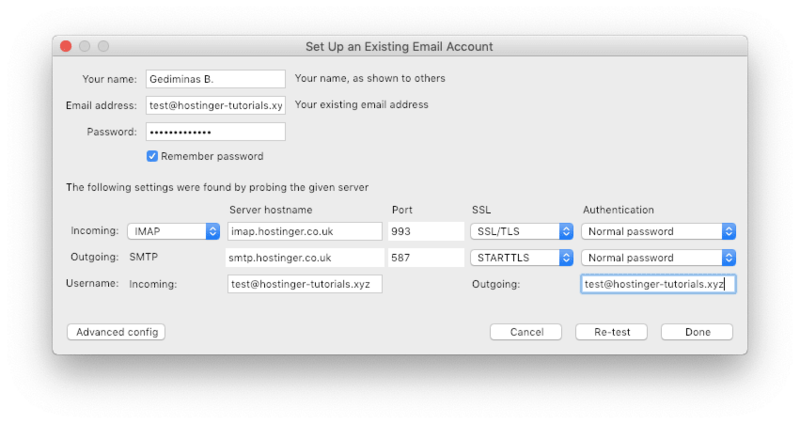 For example, if you’re using Hostinger’s webmail, all the action will take place in Webmail › Settings › Identities section. If you have a lot of emails accounts, using an email client is a great way to manage them in one place. 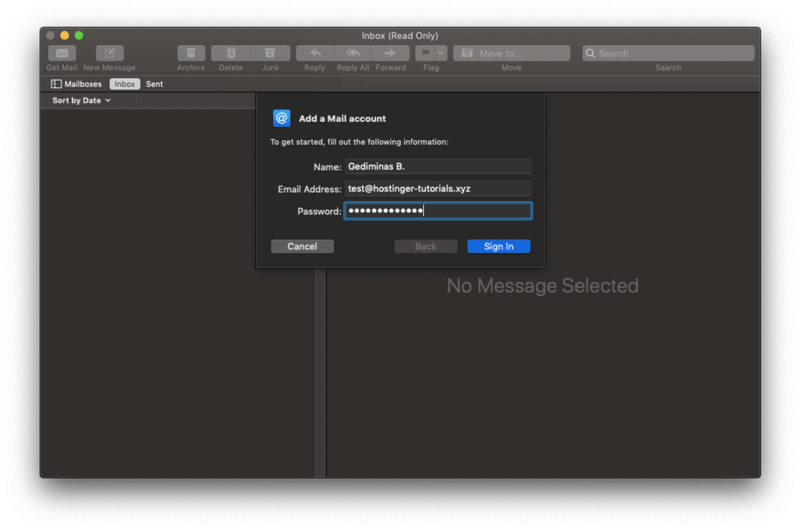 Below, you’ll find step-by-step instructions on how to configure a Thunderbird or Mac Mail client (and how to find the required details to do so). To begin, go to your hosting control panel. Based on the email service that you chose, the configuration will differ. Here’s a quick rundown on where to find the settings that you need. Navigate to the Email Accounts section under the Emails category. Scroll down and you’ll see an Email Details table with all the mail server settings. Start by opening the Webmail interface and log into your email account. Go to the Settings section, which you can find by enlarging the menu in the upper-right corner (represented by three white horizontal lines in blue background). Make sure you’re in the Accounts tab. Click on the Edit button to see your incoming and outgoing mail server details. Open up Gmail and log in. Then, click on the gear icon in the upper-right side of your screen and go to Settings. Find the Forwarding and POP/IMAP tab. Make sure to set IMAP as enabled and save the changes. Then, an additional section with the email client configuration settings will appear. 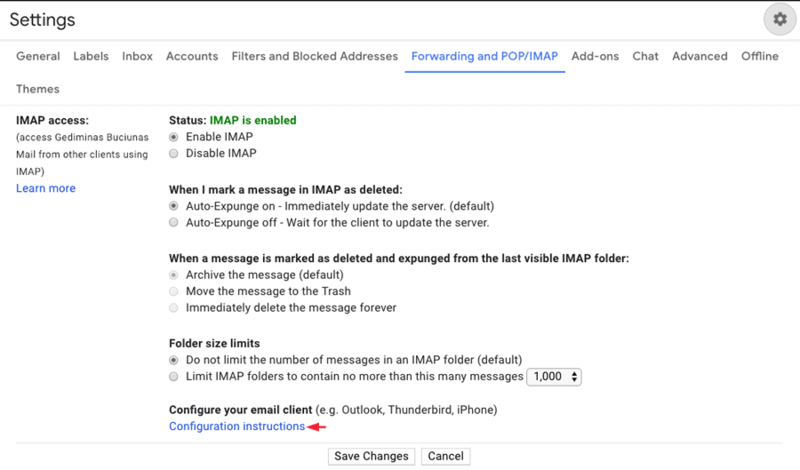 For more details, consider checking the official IMAP setup guide by Google. Since you’ve got all the incoming and outgoing mail server details, the remaining step is adding them to your email client. 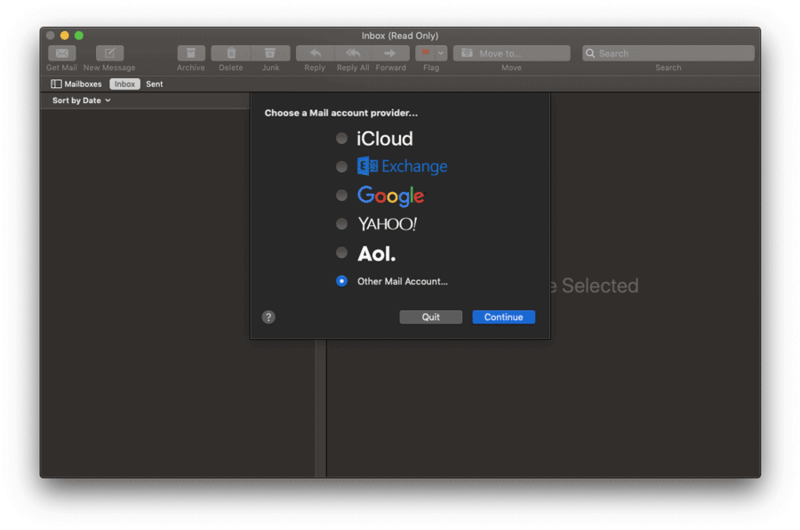 Here’s how the process would look like using two popular email clients: Thunderbird and Mac Mail. Open up the Mozilla Thunderbird client. Under the Accounts tab, click on the Email button. First, you’ll need to enter your general details: name, email address, and password. 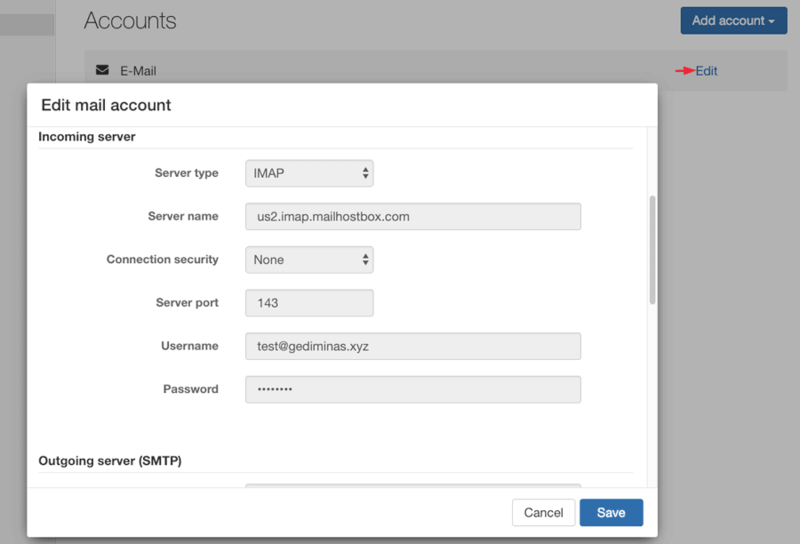 Next up, you’ll need to enter the incoming/outgoing mail server values and ports, which we located earlier. 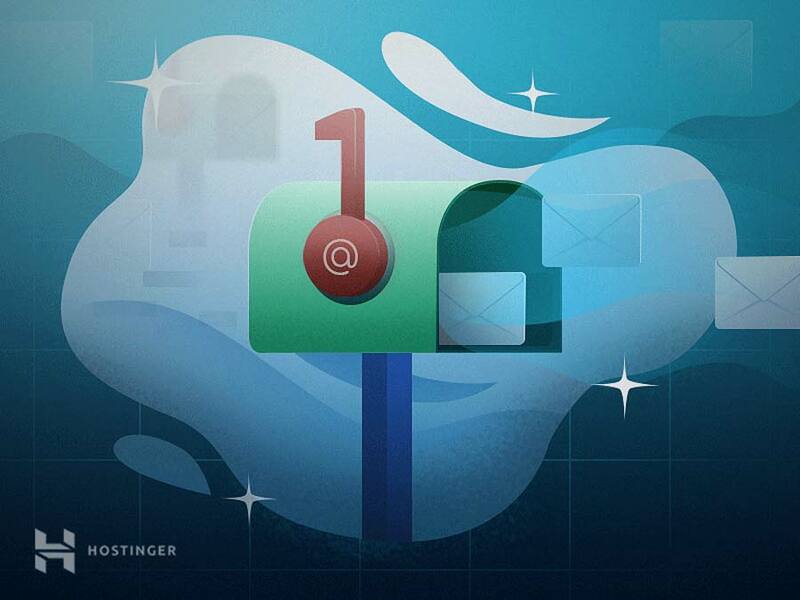 Here’s an example of the final result while using default Hostinger email services. That’s it! You can now send emails and manage everything directly from your Mozilla Thunderbird client. In the first step, you’ll need fill in the basic details: name, email address, and password. Then, enter the incoming/outgoing mail server values and ports, which we located earlier. Once finished, click the blue Sign In button to finalize the setup. Congratulations! You can now effectively manage all your mailboxes in a single place. Sending out a bunch of emails is not rocket science. But preparing good-quality mail campaigns that engage and sell is something that you’ll need to work on. Work on the subject line. While it may seem like a trivial matter, the mail subject line plays a huge role in your email performance. According to an email study, around 70% of individuals report mail as spam solely by looking at the subject. Personalize your emails. Adding a person’s name in the subject or body of the text can increase the chances of your mail being opened. But there’s no reason to stop there. Get to know your audience and optimize your content to suit their needs. Add a CTA. Ideally, the user who reads your email will want to take action. This is usually the aim of every marketing campaign. Hence, crafting a solid CTA is crucial if you want to succeed. Be mobile-friendly. According to an article by CampaignMonitor, mobile users convert better than those who open emails on a desktop device. Not only that, but more and more people use their phone to check emails instead of a computer. Test before you send. Since there are many aspects that you need to get right, send out a test email to yourself before launching a campaign. Make sure to check how if look through a mobile too! By finishing this guide, you’ve explored the various ways to create a domain-based email account that promotes your business. Unlocking the secrets of email marketing will take some time, so the sooner you start – the better! All that’s left is to grab an email hosting package and get your hands dirty.